Ada is knit in my British Bluefaced Leicester (70%) and Masham (30%) worsted yarn. The colourway shown is Limestone. The pattern for Ada can be purchased as a kit, that includes the yarn and the pattern or as a single pattern from my Ravelry store . Ada is named after Ada Lovelace, daughter of Lord Byron. A mathematician, she is often credited with being the first computer programmer. 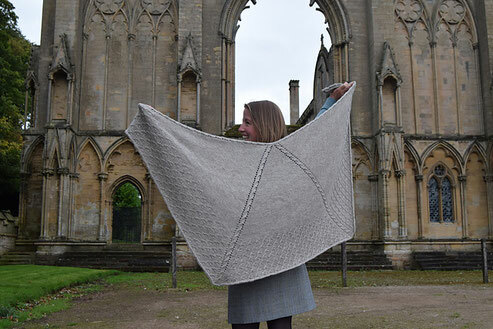 Ada is a refined shawl constructed of a trio of equilateral triangles. Commencing from a central point, the main body of the shawl is stocking stitch subtly outlined with simple mirrored cables and eyelets. Ada culminates with an addictive textured panel and a delightful i-cord bind off.